We are all one in Christ. Moreover, Jesus and Paul held women in higher regard than the culture of their day did. Women are equal with men. For that matter children are not inferior to parents and slaves are not inferior to their masters. Christ has leveled the playing field. 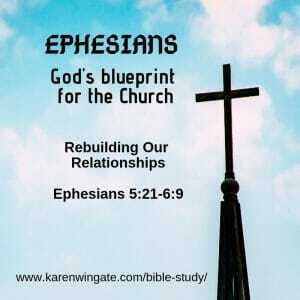 Remember what we learned in Ephesians 2? The side benefit of being reconciled to God is that we also are reconciled to each other. Now that we are in Christ, we relate to each other in very different ways. Paul is establishing the parameters of the chain of authority. As one of my husband’s Bible college professors once said, “someone has to be in charge.” Someone has to make the final decision. The chain of authority must exist in the church with Christ at the top and elders and pastors at mid-level management to oversee and care for the flock. In an ideal government, there must be a chain of command to keep order, protect the righteous, and punish the wicked. Without a chain of command, anarchy would reign. It’s true in households as well. Children need the authority of parents in order to teach them what is right and wrong. So, between two people within a household, one must be the point person and God has chosen and gifted the man to do the job. Lucky him! When is it easy for you to submit to authority? In what situation do you find it difficult to submit to others? Ladies, you may chafe at this and want to disagree with me. I stand aside. This is what the Bible says. But don’t stop reading. Push on to what Paul says next and think about this. If Paul was into making the lives of ladies miserable, he would have stopped with, wives be submissive. But he doesn’t. He puts the brunt of the relationship responsibility on husbands. What responsibility do husbands have toward their wives? What kind of love are they to have for their wives? A husband must sacrifice his own desires in order to care for his family. He must be concerned about both her physical needs and her spiritual well-being. He must care for her so well that she looks wonderful inside and out to the rest of the world. Downright radiant! He must leave all other pursuits and be of one mind and one purpose with his wife. Her spiritual maturity and purity is HIS responsibility! If a guy loved and cared for a woman that much, submission would be so much easier. Did God really mean that men are to be the sole breadwinners and women have to stay at home? Does this mean men have to oversee the finances? That women must be compliant with everything a man tells them to do? Be very careful of the “did God really mean” questions. That’s the kind of deceptive nit-picking Satan used to lure Eve out of the garden. As we have seen throughout the book of Ephesians and what we also see in Jesus’ Sermon on the Mount, God is looking at a prevailing, over-arching attitude. A husband might delegate the finances to the wife because, frankly, she’s more gifted in accounting. It might be necessary for the wife to work outside the home and she may even be the primary breadwinner. As a couple ages, the husband may fall into ill health such that the wife must make daily decisions. In each of these examples, the wife can still show respect and honor for her husband as the one who must give an account to God for the people God has placed under him. 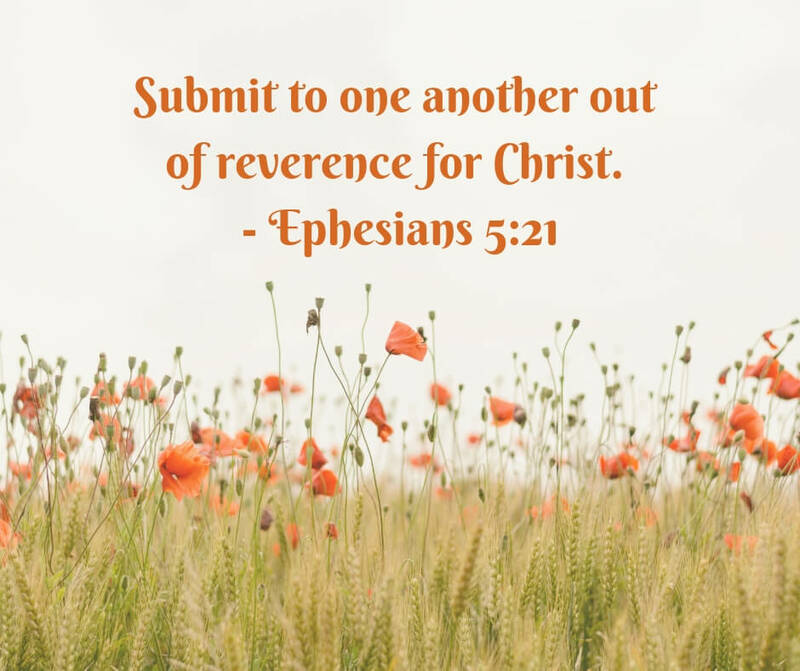 How does the Bible’s view of submission run counter to the world’s view? How have groups and individuals corrupted the Bible’s original intent? What should a wife do if her husband doesn’t love her sacrificially? What should a husband do if a wife is defiant? It is never our place to demand love or submission. No relationship is perfect. All of us are striving toward a balance and proper attitude toward each other. Give each other lots of grace and YOU be responsible for what God has told YOU to do. You cannot use your spouse’s lack of responsibility as an excuse to slack off yourself. If both sides of the marriage bed committed themselves each day to following the guidelines of these two verses, submission and sacrificial love would be far easier tasks. If each Christian placed themselves under the authority of Christ, how would that impact their various relationships? Husband-wife. Parent-child. Employer-employee. It starts with Jesus. Seek to honor Him first and foremost in everything you do. If your heart’s desire is to love, honor, and defer to him, you will find it more natural to treat those around you with respect, humility, and love. The over-arching principle of this section of Ephesians is this. Christians treat each other differently. We treat each other with love and respect. Women work with their husbands, not against them. Husbands love and care for their wives instead of pursuing their own desires. Children respect their parents’ teaching and parents are not harsh with their children. Servants and employees work hard for their masters/employers and in turn, their overseers treat them equitably and kindly, caring about them as people more than about the work they’ll get out of them. We think about others more than ourselves and we respect and abide by the need for lines of authority that will build us up and guide us to a closer faith-walk with Jesus. When we do these things, we’ll live in the light and shine as bright stars in a darkened world.